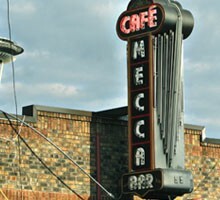 On one side, the Mecca is an old-timey counter-and-booth-style diner, for those times when only dependable diner food can hit the spot—and dependable it is. On a bad day, one of their good greasy breakfasts or the hot open-faced turkey sandwich might just save your life. On the other side, there’s one of the world’s best dive bars—narrow, noisy, well-loved, serving cheap and strong drinks with a no-nonsense attitude. The bar is always dark and timeless and weatherless, like an alcoholic submarine; you can still smell the scent of cigarettes past. Happy Hour Mon-Fri 3-7 pm ($1 off drafts, $1 off wells, $1.75 Miller drafts, $1.50 BLT and chicken tender sliders).